Plant diseases are best stopped before they start. This is true whether a disease is infectious (involving host-parasite relationships between plants and pathogens such as certain fungi, bacteria, or viruses) or non-infectious (involving disorders such as nutrient deficiencies or winter damage). Even fungicides are a form of prevention because most must be applied before infectious agents arrive. Here are nine key ways to prevent diseases before they start. Break the links in the triangle at any point and disease will not occur. For example, if you plant the susceptible crabapple Malus ‘Radiant' in an area where the apple scab fungus Venturia inaequalis is abundant, and spring is very moist, all three components of the disease triangle are in place, and the tree will likely develop significant scab disease. But if you plant a disease-resistant cultivar such as Malus 'Prairiefire', you don't provide a susceptible host and can avoid infection. Another approach is to exclude pathogens. Removing blighted potato tubers from the garden at the end of the season limits the amount of fungal inoculum (pathogen tissue responsible for causing infection) available for the next season. Cleaning up black-spotted rose leaves in the fall reduces the amount of black spot fungal inoculum. Or you can adopt cultural practices that make the environment less conducive to infection. If you avoid overhead watering, for example, you discourage infection by foliar pathogens that thrive on damp leaves. One of the most important things you can do to prevent disease is to select the right plant for the site—which is much easier than trying to manage a problem-plagued plant in an unsuitable site later. Proper plant selection will help prevent both non-infectious and many infectious diseases that are more likely to occur and be more severe if plants are stressed. With prevention timing is everything, so start thinking about it even before you plant. Read the site. Learn as much as you can about the different parts of your garden before planting. What is currently growing there? What plants are thriving on nearby, similar sites? Learn what parts of your garden drain poorly. Observe the site at different times to understand the sun and wind exposures. You can learn a great deal about the general soil pH range by noting how acid-loving plants such as pachysandra, rhododendrons, and red maple fare in your garden and nearby areas. Test the site. Soil pH is a determining factor when deciding what to plant. For failing to foot the cost of a $10 or $15 soil test, many have paid later. Some acid-loving plants will grow reasonably well for years as they reap the benefits of the soil in their root ball, but then begin to decline as they encounter more and more of the native alkaline soil. This is a very avoidable scenario. Don't guess—soil test! Know your plants. Don't make assumptions about plant tolerances in general; find out how the varieties that you want to plant tolerate sun, wind, and various soil conditions. Many people say, for example, that hollies will not tolerate wet, poorly drained sites. This is indeed true of American holly (Ilex opaca) or the Meserve blue and China series hybrids (Ilex x meserveae), which are quite susceptible to black root rot disease in wet sites. 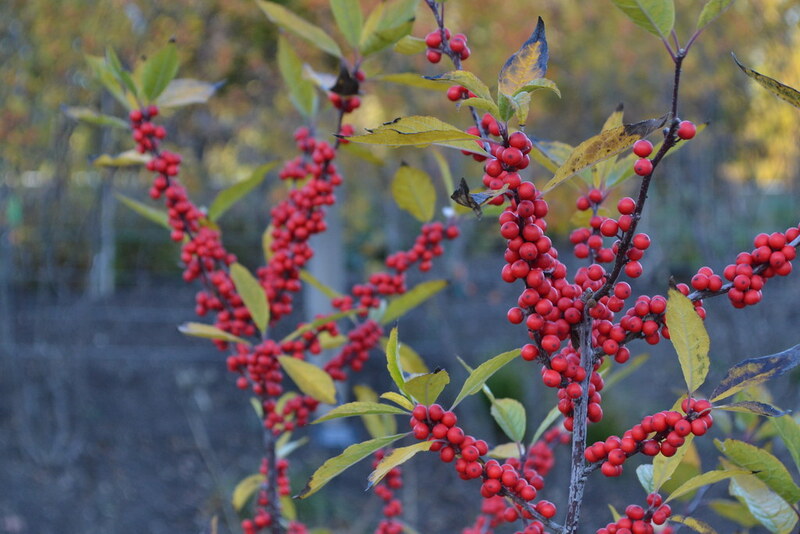 It is not true of the deciduous winterberry holly (Ilex verticillata), which thrives in swampy sites. Find out about common problems. Get a handle on the diseases of the plants you want to grow. Every plant has a profile of characteristic disease problems that develop in a particular area. Many plants are also sensitive to environmental conditions. White pine is highly sensitive to roadside salt spray, and sugar maples decline when highway salt concentrates in surrounding soils. Broad-leaved evergreens such as rhododendrons and mahonias suffer desiccation and leaf scorch when exposed to drying winter winds. Learn how plants interact. Plants interact with each other in ways that are important to consider when planning your garden. A spectacular example of this is allelopathy, a kind of chemical warfare that can exist between plants, and can cause non-infectious diseases. Black walnuts produce a chemical called juglone, especially in their roots, that is toxic to many other plants. Tomatoes growing within the root zone of black walnuts, which can extend well beyond the drip line of the tree, are especially susceptible; they will wilt and die when exposed to juglone. A more mundane type of plant interaction is competition for water, nutrients, and sunlight. All too often, landscape trees are planted too closely together. Over the years, this results in excessive shading, and root competition for water and minerals, leading to stressed plants and greater susceptibility to opportunistic fungal pathogens (which cause serious harm only on plants that are already stressed). Cytospora canker of spruce, for example, is more common and causes larger cankers when spruces are suffering from drought. Proper plant spacing will limit such problems and help prevent diseases in the long term. Selecting plants with genetic disease resistance is the best way to prevent disease. If your crabapples get scab disease and lose much of their foliage in moist springs, start planting resistant cultivars such as ‘Bob White' or ‘Red Jewel', so you don't have to spend your days spraying fungicides. No plant will be completely disease-free—that's a myth. But some plants have fewer major disease problems. Make use of all available information on the disease resistance of those plants that you decide to add to your garden. Check out the references at the end of this book on page 104. Ask your fellow plant-lovers which varieties work for them and if plant societies they may belong to have compiled specialized lists. Read the commentary in garden catalogs and on seed packets. Get information from your local garden center, arboreta, and botanical gardens, or the Extension Service in your state. Consult specialized publications for extensive lists of resistant cultivars. A word of warning: lists of disease-resistant cultivars can be useful, but take them with a grain of salt. Do not assume that any list is definitive. You may find maples listed as susceptible to Verticillium wilt, but Japanese maple (Acer palmatum) is considerably more susceptible than many other maples. Lists are sometimes only locally accurate. Roses that are highly susceptible to black spot in one part of the country may be resistant in another area because the fungal pathogen may have mutated there. 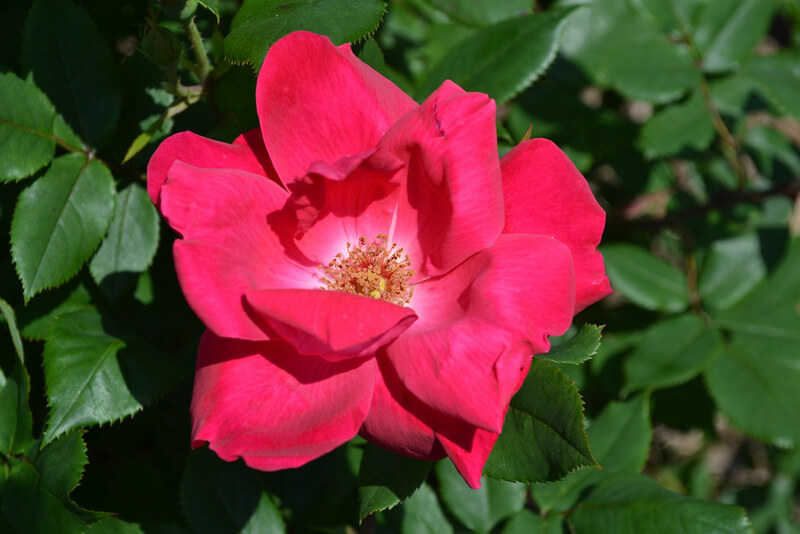 These mutants may in turn infect rose cultivars that were previously resistant. And they may be present in one part of the country only—at least for a while. Lists of disease-resistant cultivars may also ignore a plant's other good—or bad—qualities. Two lists developed by Ohio botanists rated crabapples for susceptibility to scab, as well as for overall aesthetics—flower, foliage, fruit, form, and other features. Eight of the ten most aesthetically pleasing crabapples had some scab, but not enough to affect their overall appeal; seven of the ten scab-free crabapples were in the bottom half of the overall ratings. So, take everything into account, not just disease resistance, when selecting plants. Eliminating the pathogen that can cause disease is a time-honored approach to disease prevention. Late blight of potato is the fungal disease that contributed greatly to the Irish potato famine of the 1840s–50s, rotting entire crops in the field or in storage. Potato growers quickly learned the importance of cleaning up diseased potatoes at the end of the season to limit the amount of fungus in the soil the following season. Sanitation for disease control is just as important today. The fungus that causes rose black spot overwinters on black-spotted leaves from the previous season's infestations and on infected rose canes. Remove diseased leaves and canes from the garden to keep black spot from getting a start on the new season. If disease does develop, remove the black-spotted leaves during the season to slow the repeating cycle of this disease throughout the spring and summer. An extreme form of sanitation is called roguing: removing infested plants as soon as they are noted. This is typically done with serious diseases such as orange rust of brambles. Any plants exhibiting this rust disease, including wild brambles, should immediately be removed and destroyed before the fungus spreads to healthy plants. You should also practice a form of roguing before purchasing plants. If you are buying containerized plants or bedding plants, gently knock the plant from its container and check the root system. Look for healthy light-colored roots. Blackish and slimy roots are a sign of poor root health and root rot disease. Check plants such as roses, stone fruits, and euonymus for bacterial crown gall, tumor-like growths on roots and crowns. Under certain circumstances, harvesting seed from your garden for future years can be risky, because you may also be saving pathogens that hitch a ride on those seeds, which will cause you problems later. Rotating crops is another way to prevent disease. Many soilborne pathogens remain in the ground for a considerable time, often for many years. So, in order to save susceptible plants from a pathogen, you want to separate the two. For example, if you have plants that have been diagnosed with Verticillium wilt, assume that the soil is infested with Verticillium fungus. When replanting, site the plants in a different location—where the soil may not be infested with the pathogen. Don't forget to use common sense with your sanitation practices. 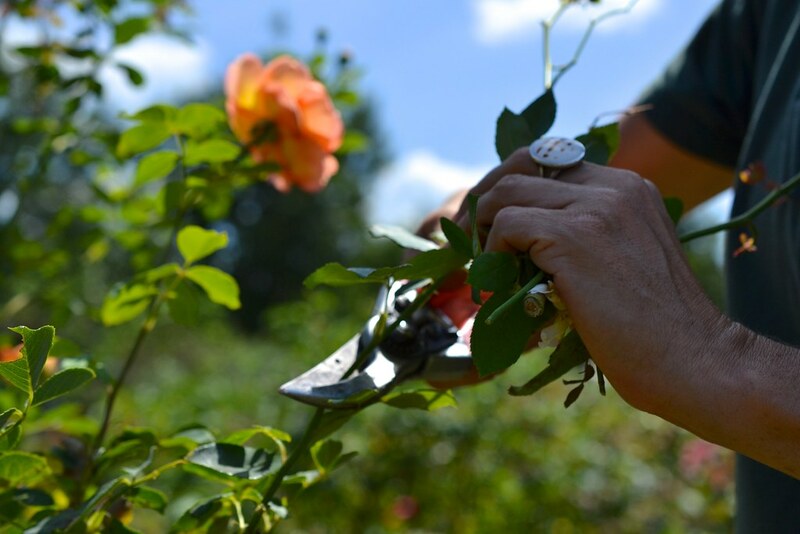 When you are pruning, make cuts on healthy tissue first, and prune out diseased tissue last. When dealing with highly infectious diseases such as fire blight, sanitize tools with alcohol between pruning cuts. Clean and remove soil from tools periodically. When you have problems with soilborne diseases such as damping-off in your seedling trays, remove the potting soil from the seeding area and sanitize the surface with a bleach solution. 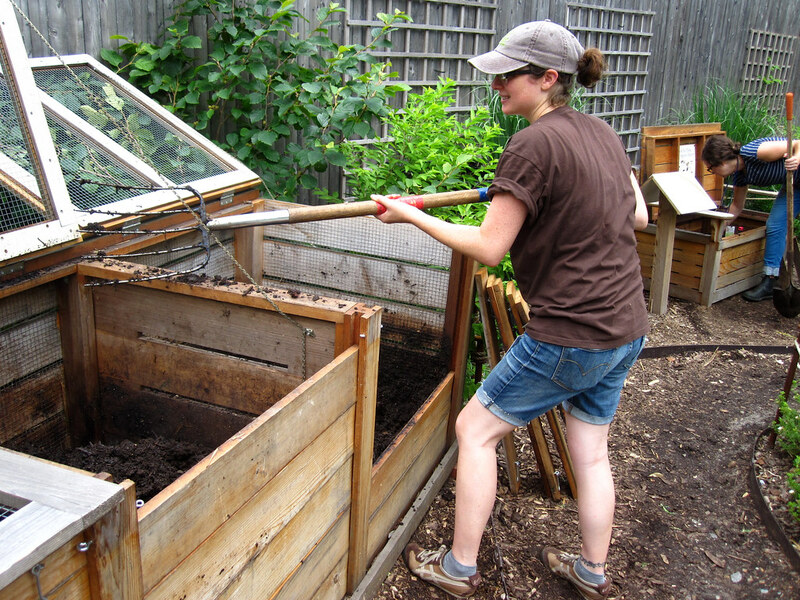 Add at least an inch of compost over all growing areas in spring, and work the compost into the top several inches of soil. Soils with good overall texture and drainage characteristics and good organic matter content tend to have a healthy balance of soil organisms, from earthworms to bacterial and fungal microorganisms, that cycle nutrients. What gardeners typically see when a good plant goes bad are its scorched and discolored leaves, and twigs and branches that decline and die. More often than not these aboveground symptoms are caused by problems with the root system. What makes for a happy root system? For many plants, the key is a moist but well-drained soil rich in organic matter. In such soils—the kind you can ball up in your hand and crumble but which does not form a ball of clay—there is both adequate air and adequate moisture for the roots to properly respire. In good soils, inorganic clay, silt, and sand particles form aggregates with organic matter, allowing optimal nutrient exchange between soil particles, the soil solution (water with dissolved minerals and associated microorganisms), and plant roots. Soils with good texture and good organic matter content also tend to have a healthy balance of soil organisms, from earthworms to bacterial and fungal microorganisms that cycle nutrients. These will coexist with other soil microorganisms that can cause plant problems, such as disease-causing root-rotting fungi. All these organisms exist in the soil in a precarious balance, which can go haywire when major environmental stresses change the equation. The best balance will be achieved by developing soils that have good overall texture and drainage characteristics and good organic matter content, which will optimize microbial activity. Adding compost to your soil will help you achieve these goals. Add at least an inch of compost over all growing areas before you plant in the spring, and work the compost into the top several inches of soil. Side-dress heavy-feeding crops such as squash, corn, tomatoes, and broccoli with an additional half-inch layer of compost each month during the growing season. People in climates with prolonged sunny stretches can solarize soils, i.e. use the heat of the sun to eliminate pathogens. Cultivate the soil to a depth of at least 4 inches. Water the soil well, then cover with clear plastic at least 1.5 mm (0.0015 inch) thick and bury and anchor the edges in a trench around the bed. At least six weeks of abundant sunshine are needed for effective solarization, which kills not only pathogens, but also beneficial organisms. That's not the only drawback. The technique will eliminate pathogens in only the top few inches of soil, probably not to the full depth of plant roots. And solarized soil is easily recontaminated. However, beneficial organisms such as Trichoderma species tend to prefer solarized soil for recolonizing, and biocontrol agents can be mixed with seeds or added to the soil when transplanting to maximize benefits. 6. Keep plants healthy: proper watering, mulching, pruning, and fertilizing. With proper plant care, you can limit the amount of stress your plants suffer and the likelihood that they will develop certain infectious and non-infectious diseases. Proper planting should be one of the first considerations. Be sure to plant trees and shrubs at the same grade that they were grown in the nursery or garden center. If installed too high, their root systems may dry out, but planting too low is even worse: it is the primary cause of transplant shock of many trees and shrubs in the first few years after planting. The deeper you go in the soil, the lower the concentration of oxygen, and the greater the chance of root stress. Plants already stressed by the loss of roots during the transplanting process, or by root scoring if they were grown in containers, may not be able to bear the additional stress of a too-deep planting. Once plants are installed, proper watering is crucial. Though many people assume that watering is easy, there are no simple rules for irrigation, so this is one of the most difficult and essential green-thumb skills to develop. Plants have individual needs that depend on the species, the size of the plant, and its stage of development. Soil type and weather conditions also come into play. Too little water can stress plants, making them more susceptible to disease organisms such as canker fungi. Excessive watering results in poor overall root function and greater susceptibility to root rot diseases. And if you water in a way that keeps moisture on a plant's leaves for long periods, you may be encouraging infection by foliar pathogens. So if you use a sprinkler or other overhead irrigation system, water early in the day when moisture is more likely to evaporate from leaf surfaces. Do not assume that plants need water. Check the soil to a depth of several inches to determine if it is still wet. For most plants, it is best to wait until the soil dries and then water deeply. Many plants, including your lawn, need about one inch of moisture per week during the growing season. Use common sense when deciding which plants might need water. For example, check seedbeds more often than sites with established plants. Mulching is a crucial disease prevention practice. Organic mulches provide many benefits: they help cool soils and conserve and moderate moisture over long periods, which can help plants resist stress due to lack of water. Moisture and temperature modification are crucial for the roots of many plants, especially if they are a bit out of their optimal soil temperature range, such as mountain ashes, flowering dogwoods, and exotic birches in hot, open sites. Over time, organic mulches such as composted bark mulches also provide important organic matter for the soil and can help control diseases by encouraging microorganisms that may act as biological controls of plant pathogens. Mulches can also help prevent non-infectious diseases: a good 2- to 3-inch deep ring of mulch around the base of plants (but pulled away from direct contact with the trunk) will suppress weeds and keep the lawn mower at a safe distance from vulnerable plant tissue. Pruning is another important disease preventive. When you cut away the knotted, black, gall-like growths from the stems of stone-fruit trees and ornamental plants infected with plum black knot, you are removing pathogens and the inoculum they provide for subsequent infections. Prune when you first notice the disease; if you wait too long, pruning will not be effective. Through proper pruning you can also keep a tree's inner foliage from becoming too dense, assuring better air movement and sun penetration of the canopy. Most fungi thrive under moist conditions, and fungal spores are more likely to germinate and infect leaf tissue when leaves remain wet. Fertilizing plants will both prevent non-infectious diseases (disorders), such as nutrient deficiencies, and help plants tolerate the damage resulting from infectious diseases. Make sure to choose the proper fertilizer for your particular plant to promote sustainable growth and plant survival. Fertilizers are not magic—and they are not "plant food." They cannot replace the food that plants produce in their leaves, but they can provide much-needed minerals such as nitrogen, phosphorus, and potassium (NPK) and micronutrients like copper, iron, and manganese. 7. Don't overwater, overmulch, etc. You can overdo many good horticultural practices, and in some cases invite the very same diseases you are working to avert. Take the case of mulching. The merits of this practice are undeniable, so how can such a good thing go wrong? The answer lies in the increasingly popular habit of amassing huge mounds of mulch—sometimes to depths of 6 inches, a foot, even several feet—around the bases of trees and shrubs. This keeps too much moisture against trunks, encouraging fungal infections. It also provides perfect cover for rabbits, mice, and other rodents in the winter, little havens from which they can munch on thin-barked plants at their leisure. Excessive mulch can reduce oxygen levels in the soil, leading to poor root metabolism and increased root rot disease. Apply only 2 to 3 inches of mulch on clay soils, somewhat deeper on well-drained sandy soils. This does not mean adding 2 to 3 inches yearly; not all of it will decompose in that time. Add only enough to maintain a total depth of 2 to 3 inches. Vigorous overwatering may be a more common trigger of plant disease than the drought conditions gardeners seek to overcome. In waterlogged soils, root function suffers because oxygen levels are low. When oxygen is scarce, certain root-rotting fungi such as the aptly named water molds, Pythium and Phytophthora, flourish. And roots stressed by oxygen deprivation are more susceptible to infection by these pathogens. Watering properly involves keen observational skills. Check the soil to the depth of several inches; in most cases, if the soil is still moist, let it dry out, then water thoroughly. Overfertilizing is another classic case of too much of a good thing. Fertilizers provide important nutrients for the plant, but remember to use the recommended rates for each plant at the correct time of year. For example, pear trees given too much nitrogen rapidly put out shoots, and this succulent growth is more susceptible to fire blight. Many turfgrass diseases are more severe on overfertilized lawns. Roots can also suffer from overly high levels of fertilizer: they will lose water through osmosis when fertilizer salt concentrations are higher in the surrounding soil—this is how fertilizers "burn" roots. Finally, be careful to prevent girdling when transplanting trees and shrubs. When woody plants are installed, the twine or wire holding the burlap in place often is not removed. Consequently, as the stem increases in girth over the years, the non-degradable twine or wire becomes ever tighter. Eventually it is imbedded inside of the bark in the plant's phloem, the pipeline that brings the products of photosynthesis down the stem to the roots. In the end, the roots will starve, and the stems and leaves will die from lack of water. All for want of removing that twine. One of the most important things to keep in mind is that you don't have to prevent all of the myriad illnesses that could descend on your garden. You could prevent tar spot of maple with fungicides, but why bother? Maples do well year after year despite the disease. Lilacs are infected by powdery mildew year after year, but it never seems to hurt the plant; you probably couldn't kill your lilacs, even if you wanted to. There are many examples of such "harmless" diseases, from Phyllosticta leaf spot of maple, to many of the anthracnose diseases of ornamental plants. Some diseases you can—and should—learn to live with, and others you will want to concentrate on preventing. Even when you do decide to use fungicides, prevention is still the key. All but a few fungicides must be applied before the fungus enters plant tissue to prevent infections and subsequent disease development. Timing is crucial: even with fungicides prevention—not cure—is the name of the game. Jim Chatfield is an assistant professor and Extension specialist with the Ohio State University Extension, where he has worked for the past 12 years. He teaches and writes extensively on plant pathology, plant selection, and plant diagnostic topics. Sarah Owens prunes in the Cranford Rose Garden. Photo by Morrigan McCarthy. Rosa 'Knock Out Rose' was bred for disease resistance and repeat bloom. Photo by Blanca Begert.